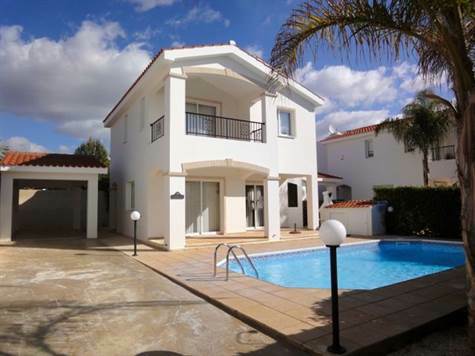 This detached 3 bedroom villa is in a prime location, within easy walking distance to the sandy beaches of Coral Bay, and the famous Coral Bay strip with it's wide variety of shops, restaurants and tavernas. The property features an open plan living room with lounge, dining area and corner kitchen including breakfast bar. The kitchen is well equipped with granite worktops, built-in oven, electric hob and extractor fan, fridge/freezer, dishwasher and washing machine. Off the lounge is a guest cloakroom, and patio doors in the lounge and dining area provide easy access to a large covered veranda, and the swimming pool terrace. Upstairs there are 3 double size bedrooms, including fitted wardrobes, and a family size bathroom. Being the largest, the master bedroom has an en-suite shower room, and private balcony with pleasant views. The pool area is private with hedges surrounding, and the spacious covered veranda provides welcome shade when required. There is plenty of parking space with a long driveway and car port. Due to the prime holiday location, the property is ideal as a holiday home/rental investment, as well as a permanent home. It is well maintained and comes fully furnished.